When I was a kid, my step-grandma bought me a set of books by Lucy Maud Montgomery. 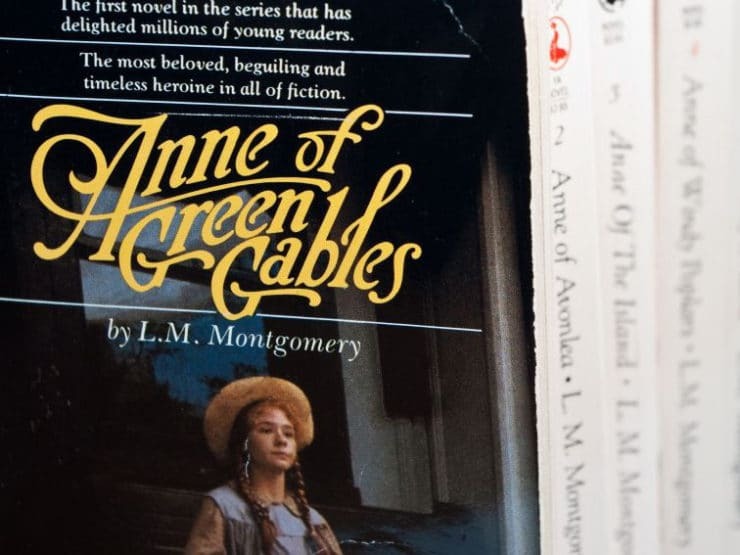 Toots (that’s her nickname) was born in Canada, and these books had been her favorite as a child—the “Anne of Green Gables” series. I was around 9 or 10 years old, and they looked incredibly boring to me. I loved books, but at that time I was into “Encyclopedia Brown” and “Nancy Drew” and “The Babysitter’s Club.” These “Anne” books sounded dated and old fashioned and slow. I thanked her politely and put the paperbacks on my bookshelf, where they gathered dust for a couple of years. One summer afternoon when I was 12, I found myself with nothing to do. I’d already read all of the books on my shelf (many of them twice), and nobody was around to give me a ride to the library. The only thing I hadn’t tackled yet was “Anne of Green Gables.” With a reluctant sigh, I picked up the first book and started reading. That summer day, my whole world changed. I don’t think it’s overstating things to say that “Anne of Green Gables” helped to shape the person I am today. As a young child, my grandparents had exposed me to historical films and classical music. I had an appreciation for history, but I had never read a classic novel outside of school. Through this book, I found myself transported to Edwardian era Canada, following the life of a little orphan girl—Anne Shirley, Anne “spelled with an e.” Though her character was created over 70 years before I was born, this little girl living on Prince Edward Island had so much in common with me. She was creative with a wild imagination. She was misunderstood by her peers, and even by most adults. She loved to speak in flowery prose. She enjoyed reading poetry and had a flair for the dramatic. But for all of her outward confidence and fiery spirit, inside she was a sensitive creature… a fragile soul, who felt every happiness and disappointment deep within in her core. I identified with Anne on many levels… in fact, I still do. I always dream big, and I remain optimistic to the very end, even when the odds are not in my favor. In this passage from “Anne of Avonlea,” the sequel to “Anne of Green Gables,” Marilla tries to comfort Anne through a difficult time. Anne’s response is pretty much the way I live my life, for better or worse. Like many young girls who have discovered Anne over the years, I devoured the entire book series with unbridled enthusiasm. There are 8 books in all, following Anne’s life from a wiry 11 year-old misfit to a happily married mother of six. The last two books focus on Anne’s children, with Anne in a supporting role. After reading the books, I was delighted to discover a beautifully produced miniseries by Sullivan Films– you can buy the Anne of Green Gables DVD’s here and the sequel, Anne of Avonlea, here. This miniseries comes remarkably close to capturing the magic of the original books. Sometimes, when I’m in bed with a cold or feeling blue, I’ll turn on the “Anne of Green Gables” DVD. It always brings a smile to my face. One autumn afternoon, Anne’s adoptive mother Marilla leaves town for a meeting of the Aid Society at Carmody. She allows Anne to invite her “bosom friend,” Diana, over to Green Gables for tea while she is gone. Anne is thrilled at the prospect of preparing afternoon tea for her friend, and Diana is equally excited—they both feel like very mature young ladies. The real Green Gables in Cavendish, Prince Edward Island. The farm was owned by the McNeil family, who were cousins of author Lucy Maud Montgomery. The drink is raspberry cordial, a sweet concoction made from fresh raspberries, sugar, and lemon juice. Marilla has allowed Anne to use a half bottle left over from a church social, a very special treat. Of course, there was a reason the cordial didn’t taste a bit like Mrs. Lynde’s… it wasn’t raspberry cordial. Anne mistook a bottle of currant wine for cordial, which led to Diana becoming hopelessly drunk. Months of drama ensued, with Anne being labeled a troublemaker and a misfit by Diana’s family. Poor Anne… always so misunderstood. I began to research the history of cordial—or “squash,” as it’s called in some parts of the world. The word cordial can refer to a variety of drinks, including alcoholic liqueurs made with fruit and other sweet ingredients. In Anne’s case, the Raspberry Cordial that she meant to serve to Diana was non-alcoholic, meaning it was a “squash”-style beverage. Squash cordials are concentrated syrups made from sugar, fruit, and water. The syrup is diluted with water or seltzer before serving. In Anne’s case, the Raspberry Cordial she meant to serve was likely a sugary homemade raspberry concentrate thinned with water. Lemon juice was often added as a preservative. In the Edwardian era, this drink would have been made with fresh raspberries. Frozen berries can be used just as easily. I used fresh, because our local farmer’s market is teeming with beautiful berries this time of year. If you’d like to make your own batch of raspberry cordial, my recipe appears below. Keep in mind that this is a traditional cordial, which means it is very sugary and should be thinned with water or seltzer before serving. 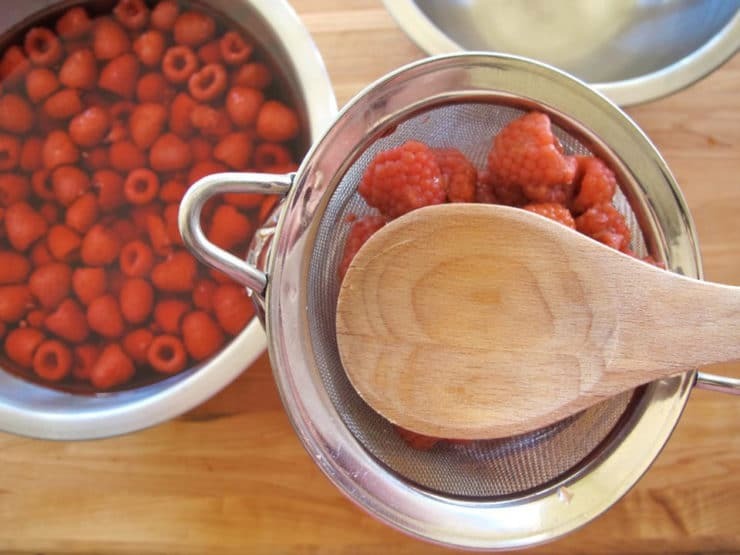 Make traditional Raspberry Cordial from the Anne of Green Gables book series by L.M. Montgomery. Recipe and step by step tutorial. Non-alcoholic. You will also need: Very large bowl, large spoon, medium saucepan, plastic wrap or towel, fine mesh sieve or strainer, medium bowl, 2 pitchers or gallon container. Note: many stores sell raspberries in half pint sized boxes, which means you would need 8 boxes of berries. Double check the weight before purchasing-- you will need 48 oz. of berries total. 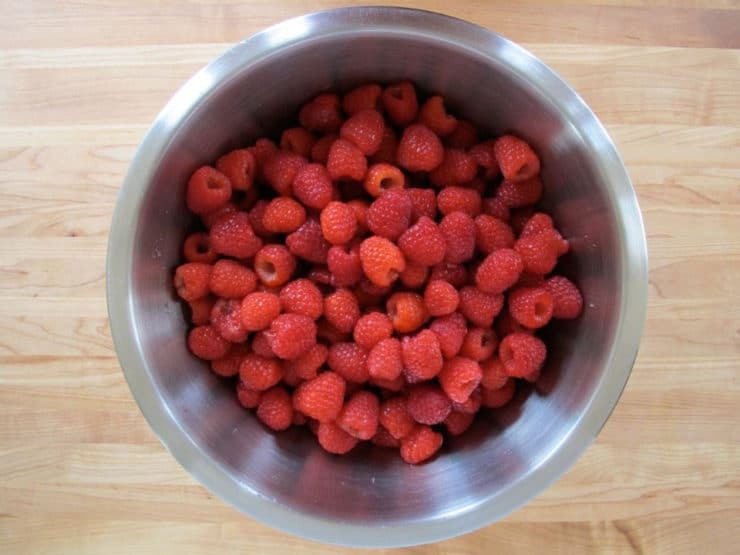 Clean and rinse the raspberries, then place them in a very large bowl. Pour the lemon juice over the berries. Use a large spoon to stir the juice into the berries. On the stovetop, heat 12 cups of water and 3 cups of sugar to a boil. Stir till the sugar dissolves. Remove from heat. 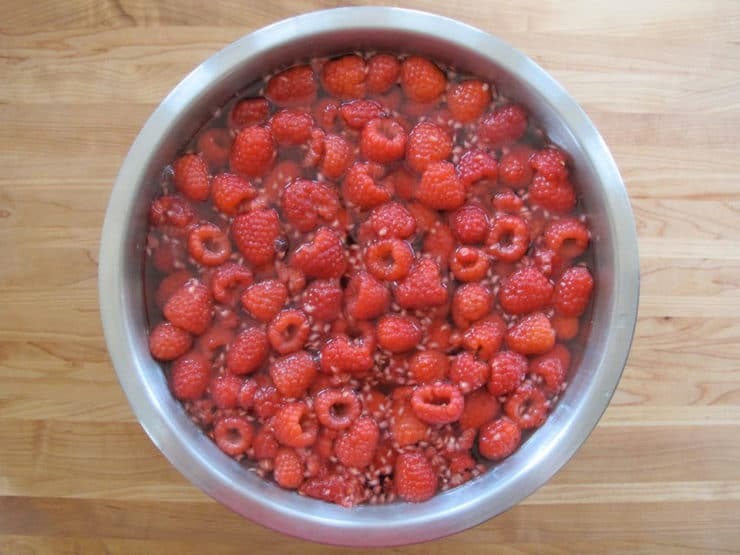 Pour the boiling water over the raspberries. Allow the water to cool for 1-2 hours to room temperature. 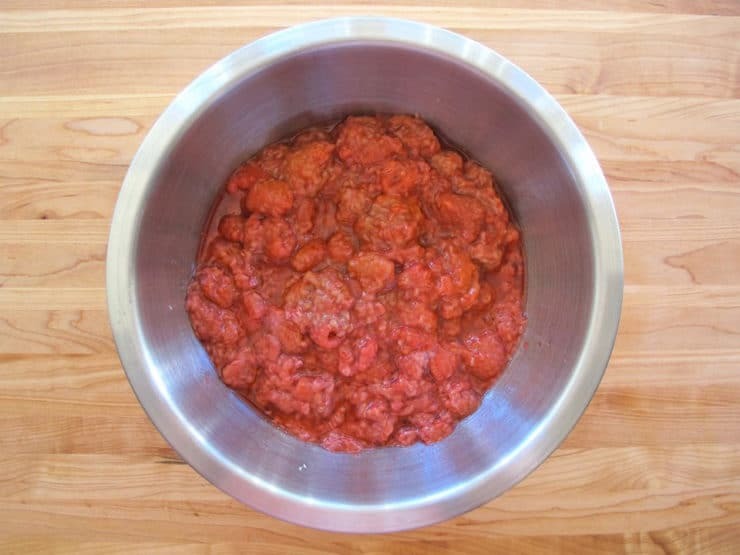 Cover the bowl with plastic wrap or a towel that you don't mind staining. Place in the refrigerator to steep for 24 hours. Pour the cordial through a fine mesh sieve to strain. Push gently on the solids with the back of a spoon, if you wish, to extract more juice. This will produce a slightly cloudy effect in the cordial, which will settle at the bottom of the storage bottle, but it won't change the flavor. If you'd prefer a clearer cordial, do not press down on the solids-- just strain them. Once you've strained the juice from the berries, you will find that the leftover berries are mushy and quite sweet. Save them in the fridge, they are terrific served as a topping for ice cream. This recipe makes a large batch of cordial, which will store very well in the refrigerator if you use a clean gallon jug. You can easily halve the recipe if you don't need quite so much cordial. There is a recipe from the Anne of Green Gables cook book that I bought in Cavendish when visiting the island. Diana Berry’s Raspberry Cordial. You take 2 bags of 600g frozen raspberries and cook it over medium heat in large saucepan along with 1 and 1/4 cups sugar for 20 min. Then mash raspberries with potato masher then mash through wire strainer into a medium bowl til you get all the liquid out and only the seeds and pulp are left. Then add juice from 2 freshly squeezed lemons. 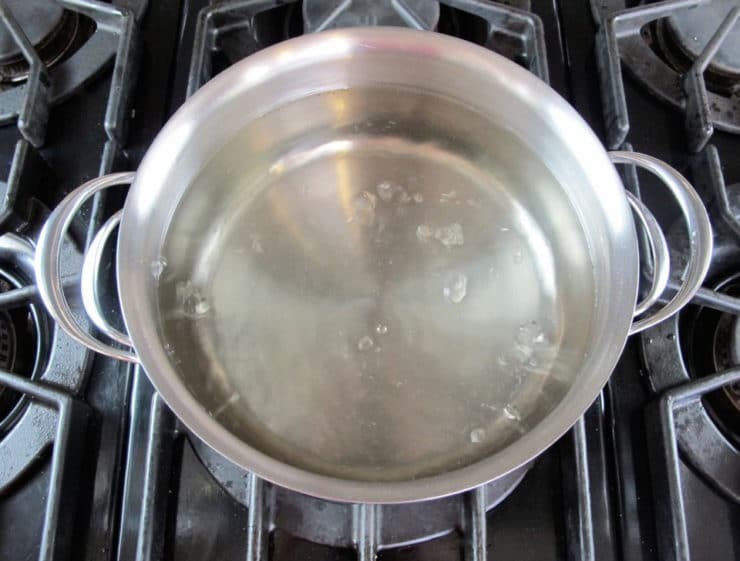 Set aside and use large saucepan (cleaned) to boil 4 cups water. Then add juice from bowl into saucepan, stir, then let cool a bit, pour into a pitcher and put in fridge. Serve cold with garnish of lemon. Hi Wende, thanks for sharing. I prefer the technique outlined in this blog. When you mash the raspberries it produces a cloudy effect; when made as written here, the cordial has more clarity. 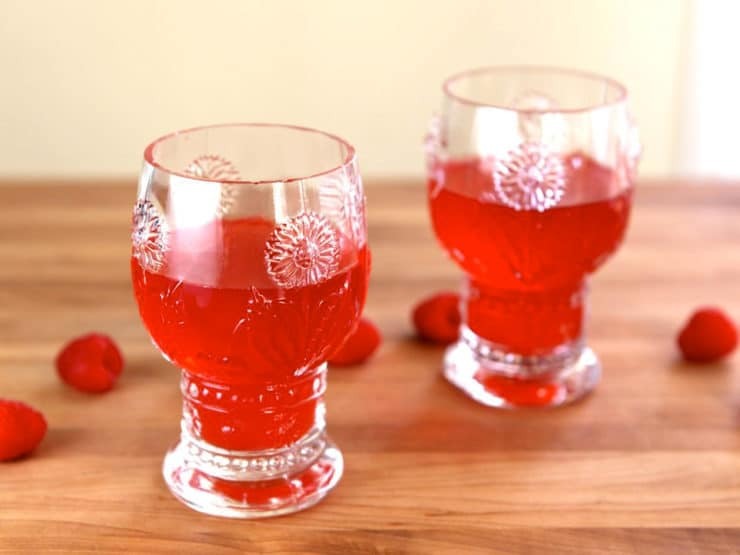 I just really want to thank you for this delightful Raspberry Cordial and Anne of Green Gables recipe blog! I learned of the books and then movie as a young mother and caused my daughter to fall in love with the books as I quickly had. We loved L. M. Montgomery’s writings so much that we made it to Prince Edward Island and Montgomery’s birthplace, the heritage site and similar sites and now are re-reading the books in a new light. I have been desiring to make raspberry cordial and was thrilled to find your recipe and essay about it. Thank you! I have to tell you, I absolutely love Ann”e” of Green Gables!! Her story is one that always brings a brightness to my day when I read it or watch my movies. Thank you for sharing your story and especially the raspberry cordial recipe! Rhiannon Tori, not sure if you will see this. I had an Auntie Toots, I bel she was born in Sidney, NS. I know she lived in Montreal, San Francisco and Vancouver, BC. Wondering if it might be the same. Any way thank you for the recipe. This was a delicious recipe. My whole family enjoyed it immensely and I will definitely make it again. We tried it with both water and seltzer, both being equally liked. I did a recipe review on my blog. Thanks so much! It was very good and when I say it’s good I mean 5 star good. Your write-up makes my heart hurt. I’ve come to understand that other people feel the exact same way about Anne and that she changed their life — to be such an influence. She’s still one of my heroes even 20 years later. If only I could live up to be as gloriously optimistic as she! Your quoted bits are ones I think of quite regularly. It seems that Anne is embedded in me in some glorious way which I wouldn’t trade for the world. Oh how delightful that you wrote this, Tori! 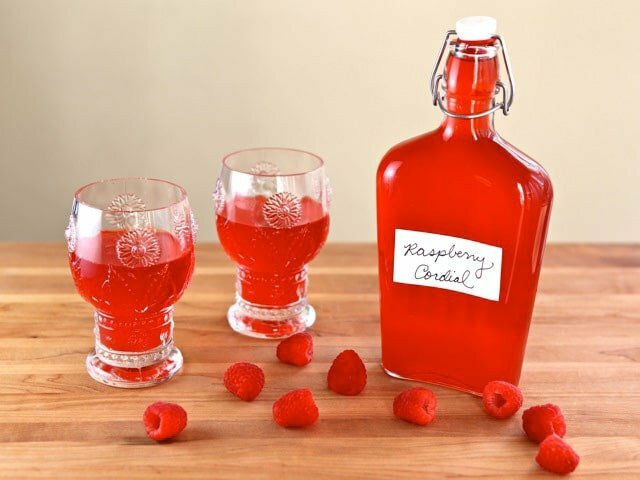 I took a break from reading Anne of Green Gables to look up exactly what a raspberry Cordial is…..because my 7year old asked what “drunk” means…..
And I was delighted to see your amazing beautiful meaningful post. Currant wine is made with…currants. Thank you for posting the recipe. My 12 year old daughter and I loved making this together. I read the books over 30 years ago and loved them. So I was so excited for my daughters to read them now. She and a few of her class mates just finished reading the first book for their literature studies class and loved it. They are getting together today for lunch today to have tea then enjoying the 1st part of the mini series. Thanks again! I also have an aunt with the nickname toots, in Canada. My mother taped A new of Green Gables back when my girls were just little. They are now 30 and 27 but still love the movie. We have since gotten the movie on dvd (all 3) but still enjoy mother-daughter time watching Anne and spending time laughing and crying together. It’s a classic to be enjoyed by mothers and daughters everywhere. Can’t thank my mother enough for introducing us to Anne. Delicious! We had lots of girls get together to watch the movie in loving memory of Jonathan Crombie, who played Gilbert Blythe. I made the cordial, and we all laughed and cried and drank dainty portions…(we weren’t greedy ebpnough to drink great tumblers full:). Thanks so much for posting. I’m jealous! What a fun way to spend a Sunday. I am 76, and read all the Anne of Green Gables avidly when they came out in England, soon after the war! I cried very often, beautifully written! But I ordered the complete books on i-pad recently, and I still adore them, and still cry at the exact same pages as 60 + years ago! I love this. What beautiful memories and what a splendid recipe! Thank you for sharing. Hi Tori, I am a 47-year-old man reading Anne for the first time, since I’m going to spend about 6 weeks on Prince Edward Island starting next month. The book is fantastic so far. I may have heard of raspberry cordial before this, but I didn’t know what it was. So, I’m glad Google brought me here. I hope to make a batch sometime this week. 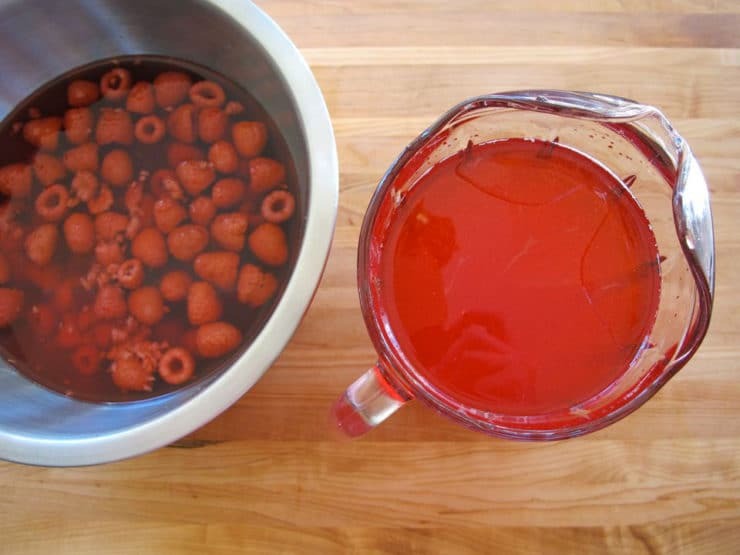 I know this is an older blog post, and you said you might give the how-to for making currant wine. Did you ever post that? Hi Brian, I never tackled it because it takes a very long time to ferment. It is still on my culinary bucket list, though. This was my all-time favorite movie growing up. I must have seen it a few hundred times. I still know all the lines by heart. I always wondered how one would make raspberry cordial!! Sounds delightful!! Having lived on PEI for many years, raspberry cordial was something I drank a lot of! There was a shop in Charlottetown, a 5 minute walk from my apartment, that sold it! As well as other PEI type treats, chocolate covered chips, fruit preserves, etc. An amazing place to live, you really get a sense peace living there! I cannot wait to try this recipe and see how it tastes compared to the cordial they make in PEI! Totally kindred spirits Koren! That sounds like a very tasty New Year’s meal. 🙂 Enjoy! 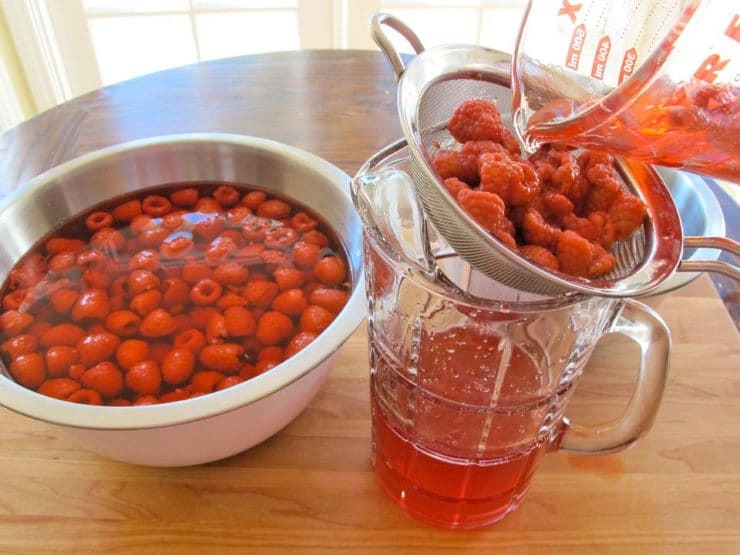 My family and I just returned from PEI (3rd trip there) and my daughter got hooked on raspberry cordial…so I thought I’d look for a recipe and found this one. We love it and have even discussed retiring there…Our last trip was 35 years ago and this trip we were able to make it with our sons and daughter together with wives and grandchildren…it was fabulous…a trip of a lifetime! I too am a huge Anne of Green Gables fan and have always wanted to go thru the Anne of Gables Home on PEI. Before making this trip I told my family I had decided I was definitely going thu on this trip…so we saw an ad which stated it was the “Anne of Green Gables Museum”….but when we got there, it was the homestead of Lucy Maude Montgomery…interesting but disappointing. We did, however get to see the musical “Anne of Green Gables” at The Guild and really enjoyed it….but still got the Anne of Green Gables home on my bucket list. Can you substitute other fruit for this like strawberries? Hi Audra, most berries will work well in this recipe. Strawberries will be great. I love the Anne of Green Gables series. I’ve read a few other Lucy Maude Montgomery books as well – all wonderful! I write silly dinner theatres as fundraisers for a local children’s camp, and next year am thinking of an Eastern Canadian one.. where Anne would hire Magnum P.E. I… lol. Raspberry cordial would be a nice drink at the dinner. Thanks for this recipe. Can’t wait to try it! My favorite series, by my favorite author. I’m really excited to try this recipe! I have tried the Raspberry Cordial they sell at the gift shop but homemade will certainly be better. My memory of my visit to PEI is precious to me, I even ran through the Haunted Woods (because I didn’t realize how long the pat was and I had to run madly to catch my bus, my Aunts had to convince them to wait for me as I was still a minor). PEI, and Canada in general, is gorgeous, I long to move there! I’ve been obsessed with Anne since I was about 8 when I saw the mini-series when it first aired on PBS. My mom had tried to interest me in the books, being among her childhood favorites, but I was too young. After the mini-series, I devoured the novels. We went on a family vacation to PEI when I was 12. You need a copy of the Anne of Green Gables Cookbook. It has the recipe for Raspberry Cordial, the recipe for Plum Pudding and sauce (mouse optional), Anne’s Liniment Cake and everything else! Hello, I am a 51 year old woman who has recently been reading the Anne Of Green Gables Series. I have found them to be most delightful! They have brought me great joy, laughter and tears and I find them to be very charming. I think if given the chance any young lady would enjoy them tremendously! Would it be OK to sterilise bottles in the normal way (either in the oven or boiling water) and then store in a cupboard. I live alone and even 2 bottles would last a while. Hi Ann– if you are familiar with sterile canning processes, then yes, absolutely! Everyone should try these experiments. It’s alot of fun. I made this recipe a few days ago and shared some with a neighbor. She loaned me her strainer…lol!!! I have to say this was fun to make and was delicious. I plan to make more of it and maybe even use blackberries next time. Thank You again, Tori, much appreciated!!! While the cordial sounds delightful, I am curious about where to find the bottles like the one shown here with the cordial. What a sweet post. I was brought here by Pinterest and am so glad. I love Anne and just reading the few quotes you provided in your post brought me back. Of the many things I look forward to when I become a parent, reading the Anne books to my children is one of the biggest. Another Anne lover here! Hope you will do the pudding with mouse sauce (without the mouse of course!). I hope everyone at the cast party will like it, what do you think? They will love it. It is very sweet and strong (a concentrate), so bring water and ice or sparkling water to dilute it according to taste. Enjoy! My daughter and I are playing Minnie May and Mrs. Barry in a local production of “Anne,” and will be making this to bring to our cast party! We were delighted to find the recipe and your blog post, especially since our big scene involves the “raspberry cordial” and my daughter chanting, “Diana’s drunk! Diana’s drunk!” Can’t wait to see how it turns out. Thank you! I love the Anne of Green Gables books as well. I first read them when I was in High School. I recently found the books in the basement of our house. I am currently re-reading the books and enjoying them all over again. I can’t wait to try this recipe out this weekend. Thank you so much for posting this. I love Anne and she is a continuing source of comfort to me. Thank you for posting this. It brought an immediate smile to my face. Your feelings about the books are so close to my own. I absolutely love them and may just dig them out again to relive them. Hi! I love this recipe and at school in Food Tech I would love to do an “Anne’s Golden Picnic” hamper (a project, kind of majorish part of the year). For this I’d really like to the raspberry cordial but raspberries, even frozen, are just too expensive. I was thinking then of doing a red currant cordial (not wine, unfortunately, because it is for school). Do you know where I could find a recipe for this? And I love love love this page! I spent so much time over it and reminiscing! So happy you enjoyed the article Alison! Sorry it took some time to respond. Not sure about the red currant cordial, but I’ll keep my eyes open for it. I checked the “Anne of Green Gables Cookbook” but didn’t find a recipe there. Good luck! I came here through Pinterest as the picture of the Raspberry Cordial and the Anne of Green Gables tag totally drew me in. I really enjoyed the article and thank you for the recipe. I have to ask if you took the photo of the cordial as I just love the glasses and would like to know where they were purchased. Also would like to ask if you think this recipe would work with lemons or limes? I absolutely love limeade and would love to find a good homemade recipe to make the syrup for it. Thank you. Hi Colleen! I’m not sure about the lemon/limeade idea, it would probably work but I haven’t tried it myself so I can be sure. The glasses came from Anthropologie, I believe… either that or World Market. My mother gave me Anne of Green Gables when I was about 12 and have loved the book ever since. I always ask any Ann/Anne if her name is spelled with an “e” and have to admit it influences me a bit. There is just something about that ‘e’! I always wondered about that cordial and cannot quite believe my good fortune that it is on your History blog – that I just discovered this morning! For a while, without checking the book, I thought the cordial was made with elderberries which seem to have found a new popularity. I can see you that you have many “kindred spirits”, to quote Anne, who have discovered your lovely blogs. I count myself as one. Welcome Susan, and thank you for your kind words! I love the Anne of Green Gables books. I first read them when I was in about grade5 and not yet living in Canada. Prince Edward Island seemed like a fantasy place. I never knew that someday I’d live in the same country as Anne (although I have yet to go to PEI). The book became a favourite of mine fast and I totally understand what you mean when you say it shaped who you are today. It did for me as well. I have read it many times over the years and I am so excited to try this recipe and finally know what the girls were supposed to be drinking that day. This was such a fun post. I love Anne and whenever I am REALLY down, I can always feel better by watching her. I have the books, movies, dolls, tea cup, and even a great paperdoll book that turns into the house when you open it. Thanks for this recipe. It made me smile. I SOOOOO LOVE Anne of Green Gables!!! Thank you so so much for this. I have relatives who live on Prince Edward Island and they keep asking when I am coming to visit. I sure wish I had the money to go there. One of these days! Hi Daniela, I don’t know about herbs or flowers, but other berries might work. You could try it with blackberries, boysenberries, loganberries, or sliced strawberries… all of those would likely work great. Enjoy! In answer to your question, I have made this with several kinds of berries so far, the usual raspberries was delightful. I then tried strawberries & sliced cherries again pretty good. Last weekend I made a mixed berries cordial. Next month I plan to use frozen blueberries. Can you substitute a liqueur for the water, If so any suggestions? I’m not sure about that Patricia, I’ve only made a non-alcoholic version. My daughter and I love Anne! I will make some of this for Christmas Presents this year. I won’t tell her where the recipe came from. Just one question – does it have to be stored in the fridge. I wanted to make quite a bit and put them in bottles but won’t have that much room in the fridge. Hi Gwen– please do tell her where the recipe came from! Part of the reason I work so hard on this site is to bring people back here again and again to experience more food history and fun. As for your refrigerator question, yes, it does need to be refrigerated unless you are planning on using a sterile bottling process. We’re are going to give it for gifts to. I love discovering new and exciting blogs! I thought I was the only lover of the Anne series…..and History, at that. I seriously just watched it two days ago! I love that you have found a way to incorporate one’s love of history and cooking together. Great way to learn and appreicate our world today and of yester-year. I’ve always loved Turkish Delights. There is a great scene from the Cronicals of Narnia where they partake in the sweet treat. Can you add these to your blog? I am dumb founded over how much your story mirror’s mine! The only difference is, I was every bit of an adult of about 19 or even 20 when given this 8 set series by a friend who was getting rid of “junk” to move. I too took it to be nice, but remember thinking ‘how juvenile!’. On a lonely bored out of my mind day, I picked up the first book, needless to say 3 weeks later I was done with book 8, and couldn’t wait to start over again! I tell you ,your words wring true when you say they changed my whole life! I didn’t come to appreciate history until reading these books. And found myself being jealous that I was not born during this time. Inside joke between my husband and myself when watching something really old, I always say I should have been born during this time. My husband says, ” No you don’t, you would have been a slave during that time. This is true since I am African American. But I can’t help feeling that way. Lucy Maude Montgomery was just genius! So much so that I almost refuse to believe that Anne was not real. There is only one other person that could make me believe in characters that way, that you know to be fictional, and that was Agatha Christie. Any how, after Anne spelled with an “e” I looked for anything by Lucy Maude Montgomery, and came across a lovely short story Kilmeny of the Orchard I fell in love with that book so much, I vowed to name someone that one day if ever given the chance. Little did I know at 28 I would have the chance to name my very own daughter Kilmeny. She is now 14 and equally enjoying Anne of Green Gables as well as her name sake book. And I tell you she is herself very much like Anne, a girl who is a true ‘kindred spirit’ with ‘lot’s of scope for imagination’. But there is one thing we differ on, you and I. I loved the books Lucy wrote soooo much that it has taken me quite some time to adjust to the Walt Disney series. I still can’t watch and love them as comfortably as the books. I should have seen them first maybe I wouldn’t feel that way,but as the saying goes, no matter how good the movie, the book is always better. After falling so in love with those characters, coming to love each and every one of them,(even Ruby Gillis!) not even Walt Disney could do true justice enough for me. As another commenter said I am truly jealous you have been to PEI and I never have. A few years ago I did email the museum their in honor or Lucy, and they sent me some wonderful literature and keepsakes things. It is one of my dream vacations, just can’t get the hubby to agree. I want to thank you for this wonderful recipe, keeping the memory of these wonderful characters, of Anne and her creator Lucy Maude Montgomery alive. In this time of face book and playstation, and cell phones and such, it’s so nice to share with my daughter a simpler time when life was just sweet. How long is this cordial likely to last? I’d like to make it for a present and would ideally love to make it in advance! Also, should it be kept in the fridge? Thanks! Hi Cerl, I recommend refrigeration unless you are using a sterile canning process. If kept in the refrigerator, the cordial will last for many weeks. Sugar and lemon are both natural preservatives. Enjoy! Thank you so much for starting this series! I have always been interested in the history of foods and cultures and am always surprised at the complexity and sophistication of recipes from hundreds of years ago. I love Anne as well. I always refer to my husband as ‘my very own Gilbert Blythe’. I would not trade my memories for the world of the times my family and I have spent vacationing in PEI. Started back in “1992”, was my first trip and we continued going when we could BUT sadly we have not been back to the Island since “2007”. Those that have not made this trip to the great Island MUST add it to their list of places to go for I know many of us have a list like that saved. Great pictures for this Raspberry Cordial!!! Looks so tastey and I will have to try making it. Visiting PEI is also on my list! 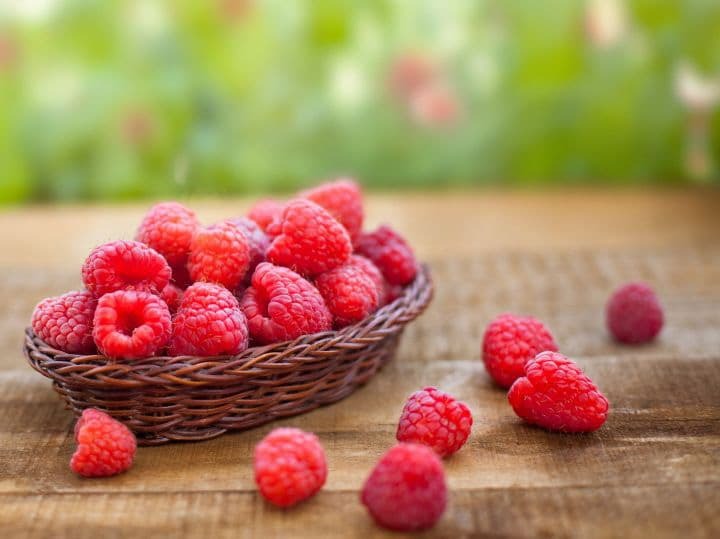 Love your photos– I’ve always wanted to try raspberry cordial. But goodness- raspberries cost a pretty penny in these parts(I sound like Marilla); I’ll have to check out the price of frozen. I’m thinking it’ll be at least $20 to make this in southern CA. Frozen are much more affordable, and should work just as well. Gorgeous presentation! Where did you find the bottle? We must be kindred spirits! I too make raspberry cordial but I follow the recipe from the Anne of Green Gables Cookbook. 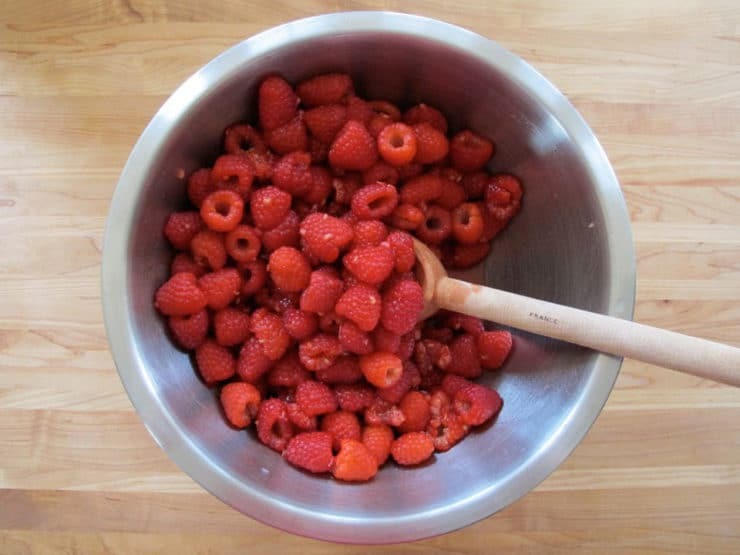 I mash the raspberries with a potato masher while they are cooking on the stovetop. I use cheesecloth to strain it. I buy special wine bottles to pour it in with a funnel. I have four daughters and for the one who are over 21…I let them add a little vodka to theirs! The movies are a favorite of all the sisters including me. My daughter,Francesca, dressed up like Anne and made an entire dinner from the cookbook when she was in middle school. The creamy vegetable soup is amazing. I also make Marilla’s plum pudding in my crock pot! I devised a way to cook it inside another container kind of floating in the crock pot tightly covered. I definitely want to visit PEI too in this lifetime. My oldest daughter, Lucia, has a blog called Raspberry Cordial for people who love to read and she has one called “Heroine TV” that is incredible with tons of recounts on TV shows. She read all the books first in the family and inspired her sisters to read them. Anne of Green Gables! Thanks for reminding me of one of my favorites, both books and movie. I just love the way you write and the recipes. History has always fascinated me, especially the history of food. I’ll definitely have to try this recipe. It kind of reminds me of something that Russians make all the time called kompot, made by cooking fruit or berries with sugar to make a very concentrated liquid and then diluting it with water. Yum! The raspberry cordial sounds wonderful. Do you know how long it will last in the fridge. It would be a wonderful drink to serve on a Summer afternoon. Hi Judi, it will last quite a long time in the refrigerator– at least a month, if not longer. Sugar and lemon juice are natural preservatives. Enjoy! I also love the “Anne” books and re-read them regularly, even now. The passages you quoted above are some of my favorite, as well as the green hair episode in the first book. I can’t wait to try this recipe since raspberries are wonderful right now. Thank you so much! Gotta love the green hair scene… classic! Susan, it is most definitely on my bucket list… I want to visit so much! My family and I just returned from PEI (3rd trip there) and my daughter got hooked on raspberry cordial…so I thought I’d look for a recipe and found this one. YOU ARE ABSOLUTELY CORRECT in your post about PEI and the friendly people…we love it and have even discussed retiring there…Our last trip was 35 years ago and this trip we were able to make it with our sons and daughter together with wives and grandchildren…it was fabulous…a trip of a lifetime! You are so lucky to have roots there. I too am a huge Anne of Green Gables fan and have always wanted to go thru the Anne of Gables Home on PEI. I was so disappointed this trip because I told my family I had decided I was definitely going thu on this trip…so we saw an ad which stated it was the “Anne of Green Gables Museum”….but when we got there, it was the homestead of Lucy Maude Montgomery…interesting but disappointing. 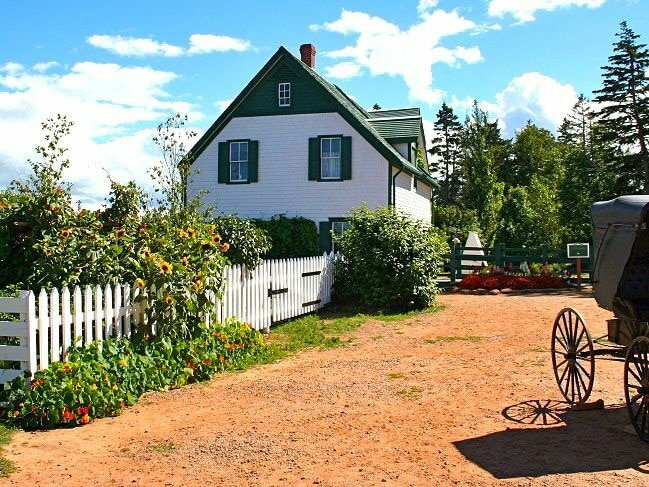 We did, however get to see the musical “Anne of Green Gables” at The Guild and really enjoyed it….but still got the Anne of Green Gables home on my bucket list. This is so wonderful. Can’t wait to make it this weekend! Now I kind of want to re-read the entire series, too. I haven’t read it since I was in high school. I bet it holds up. It totally holds up Stella! I’ve become so nostalgic working on this post that I might have to pick it up again too. I’ve lost count how many times I’ve read the first book! I also loved Anne of Green Gables and enjoyed re-reading the books as an adult! The food that most caught my fancy was “plum puffs.” A book called The Anne of Green Gables Treasury has a recipe, but they don’t seem as magical as the idea I have in my mind from the Anne books. I think LM Montgomery was a fantastic nature writer, too. Her descriptions of the PEI landscape are so evocative! Your picture of Green Gables above brought a smile — I have a similar one, except my daughter is sitting in the wagon! We visited in 2010. As for a “cool, dark area of the kitchen” — we don’t have such a thing, especially during berry season. Is it okay to let the berries steep in the fridge? Hi Nina! I’m so jealous that you’ve been to PEI, I’ve always wanted to visit– it’s a dream of mine. Yes, if you have room in the fridge for a big bowl, you can put it there. Just make sure you leave the mixture out for 1-2 hours till fully cooled before transferring to the fridge.